A town is split over controversy as thousands of migrants arrive at the border. As a caravan of thousands of migrants arrived near the U.S.-Mexico border, the residents of Brownsville, Texas, have found themselves on the frontlines in the debate over border security. After President Trump ordered more than 5,000 U.S. troops to the border ahead of the arrival of a caravan of thousands of Central American migrants seeking asylum in the U.S., about 1,000 of those troops were deployed to Brownsville, which is located just steps away from the port of entry to Mexico. Residents of what was a quiet community are now caught between the outside pressures from Washington of a perceived crisis and the reality of the migrants’ plight on the ground. "We've become a political football is what’s really happened," said Mike Seifert, a Brownsville resident for 30 years. Just this weekend, after months of rising tension over the caravan travelling north, chaos erupted over 1,500 miles away in another border town, Tijuana, Mexico -- south of San Diego. Several hundred Central American migrants were protesting at the border. First, they clashed with Mexican police in riot gear, then skirted pickup trucks and barriers into the maze of canals near the San Ysidro border terminal. 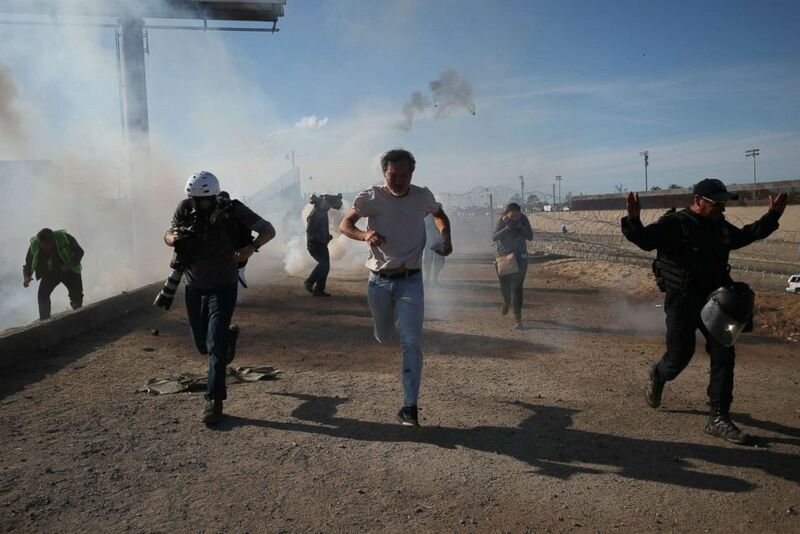 (Hannah McKay/Reuters) Migrants and members of the media run from tear gas released by U.S border patrol near the fence between Mexico and the United States in Tijuana, Mexico, Nov. 25, 2018. 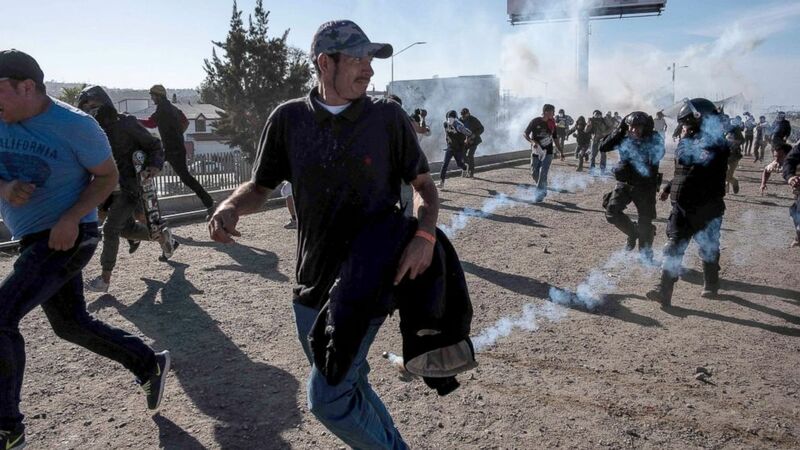 Behind coils of barbed wire, dozens of heavily armed U.S. Border Patrol officers unleashed a wall of tear gas. Hundreds beat a frantic retreat. Among those engulfed, mothers clutched their children. This weekend’s violence comes after repeated threats by President Trump to close the border with Mexico. The president also repeatedly called the migrants a threat and a national emergency. "Immigration is a very, very big and very dangerous — a really dangerous topic, and we’re not going to allow people to come into our country that don’t have the wellbeing of our country in mind," Trump said on the South Lawn in late October. In reality, what ABC News found inside the caravan was many desperate families. Women like Bianca, who was marching north with her three children. She told ABC News she was seeking asylum because she was concerned the gangs who killed her husband back at home would come back for the rest of the family. As the group made its way north, just weeks before the midterm election, the Trump administration deployed those troops. But the sudden influx of troop presence in Brownsville unsettled many of the city’s residents. "This militarization of our section of the border has been going over the past number of years but ramped up precisely under the new administration," resident and ACLU of Texas Border Advocacy Strategist Mike Seifert said. "You have them practicing riot control on the bridge. We never see that. Then you have barbed concertina wire laid out all over the place. It looks like we're at war ... and that's all within the last three weeks." And it’s not just military here. Some, emboldened in part by President Trump’s sharp tone on immigration, have taken it upon themselves to help protect the border. Shannon McGauley is the founder of the Texas Minutemen -- a citizen-militia group he said observes and reports to law enforcement and border patrol. "There’s an eight-mile stretch here to the ocean that’s not really patrolled very well at all," McGauley said. "From what I talked to the locals, they say a lot of activity happens at night in terms of the drugs." McGauley said others will join him based on the movement of the caravan -- armed: "It’s Texas," he said. He also weighed in on residents who aren’t worried about the caravan: "I think that they’ve come accustomed to it. ... This is the United States that belongs to us. So you come over through a port of entry and we welcome you, but don’t come over and make a fool of us." Elisa Filippone is a Texas native who has lived and worked in Brownsville for the last 17 years. To her, the rhetoric out of Washington is just that -- words, not her reality. "I don't need defense from people who are partly dehydrated, and who have their 3-year-old on their shoulders, and who are probably sick, and in shock from what violence their fleeing. I don't need to be protected from them," she said. "They're coming for a better life," Filippone continued. "A place with running water a place where they don't have to fear the police, a place where when their daughter gets raped they can actually seek some justice, a place where their son doesn't get kidnapped to join a cartel." She’s part of a local group of residents who’ve responded to the migrant crisis by volunteering their time, providing aid and assistance to asylum speakers. Filippone showed us medication including ibuprofen, vitamin C and sunscreen, toothbrushes, first aid kits and more that were donated. A few blocks away, we meet Sergio Cordova and Mike Benavides -- two other Brownsville locals. It’s 6:30 in the evening and they’ve got a long night ahead of them. "We were walking around this area just thinking, you know, how can we make things better? How can we help the situation?" Cordova said. "Why don’t we start a kitchen there? Where we can make the food and be able to feed, and not spend so much money on fast food and things like that." (Guillermo Arias/AFP/Getty Images) Central American migrants run along the Tijuana River near the El Chaparral border crossing in Tijuana after the US border patrol threw tear gas to disperse them, Nov. 25, 2018. Inside the apartment where they prepare the food is another Brownsville volunteer, Brendan Tucker. He makes meals for migrants stuck on the Mexican side of the border. "In the evenings we start the kitchen process, which is feeding the people at the international bridges," Cordova said of serving asylum seekers waiting and living on the Gateway International Bridge between Brownsville and Matamoros. Tucker said he prepared 40 pounds of chicken for the 35 people on the two bridges. "It’s a pretty good system, it’s getting more organized every day. We’ve got heaters out there, tarps, cots and blankets." Cordova said they walk to food over in wagons, and cross the Gateway Bridge on foot. We crossed with Cordova and his team from Brownsville to Mexico via the port of entry. A small tent city there has become a temporary home for migrants waiting to cross at a legal port of entry to claim asylum. The people at one bridge are placed on a waiting list of sorts -- only a handful are allowed through each day, as part of a series of changes that some said encourages illegal crossings and is meant to deter people from seeking asylum. "I've lived here all my life I've never seen people living on the bridge ever. So this is something new within this year," Cordova said. "It is tiring," Cordova’s partner Mike Benavides said. "But just knowing that these asylum seekers are being received ... in an American way, with open arms, that's what America is all about, it always has been." Just before daybreak, Cordova and Benavides welcomed migrants at the bus station who have processed through a detention center, the first step in a long road to asylum. "I served in the Army for eight years. I went to Desert Storm," Benavides said. "If I believe in something I defend it, I go for it. I believe in America. I always have." To Cordova and Benavides, welcoming those in need is the American way. Wilmer told us he fled Honduras with his pregnant wife after several of his relatives were killed by gangs -- he himself receives death threats. "This is a crisis," Benavides said. "It’s an international crisis and it’s happening in our backyard. Like I’m giving all I have to it."